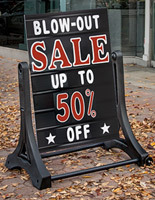 This 47" fillable base outdoor letterboard set is designed to be a sturdy, stable advertising platform. 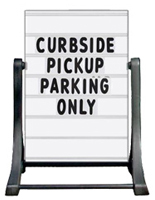 The tall 24" wide 2-sided white sign comes with a full set of 4" vinyl lettering plus (2) 9" headers and a set of (22) 8" tall numbers. 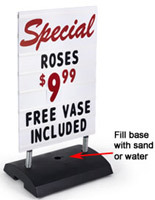 The fillable base outdoor letterboard set features a tip and roll construction made even easier by a built in sign handle on the messaging board and hidden wheels in the bottom. 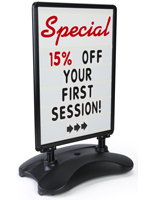 Each kit comes ready to use with the white 2-sided messaging board, the changeable vinyl lettering and the black plastic base. 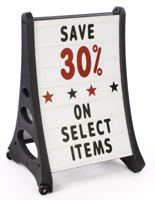 The durable outdoor letterboard set is easy to move as needed yet stable when in place because of the weighted base with wheels. 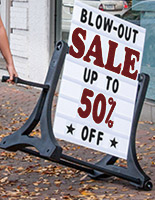 This type of advertising fixture is perfect for fast-changing messaging for restaurant or store specials, sales or events.